This in itself is quite unusual, in that most coin inscriptions are in upper case (capitals) only. 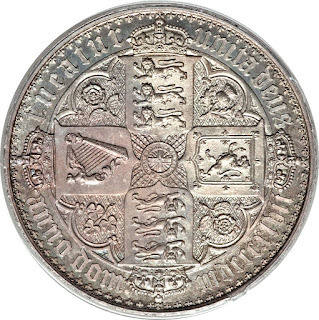 VICTORIA DEI GRATIA BRITANNIAR REG F D.
Reverse: Crowned cruciform shields bearing three lions passant for England, lion rampant for Scotland, and harp for Ireland. In the angles are roses, a shamrock and a thistle. In the centre, the Order of the Garter, bearing the inscription "HONI SOIT QUI MAL Y PENSE". All contained within a tressured circular panel. 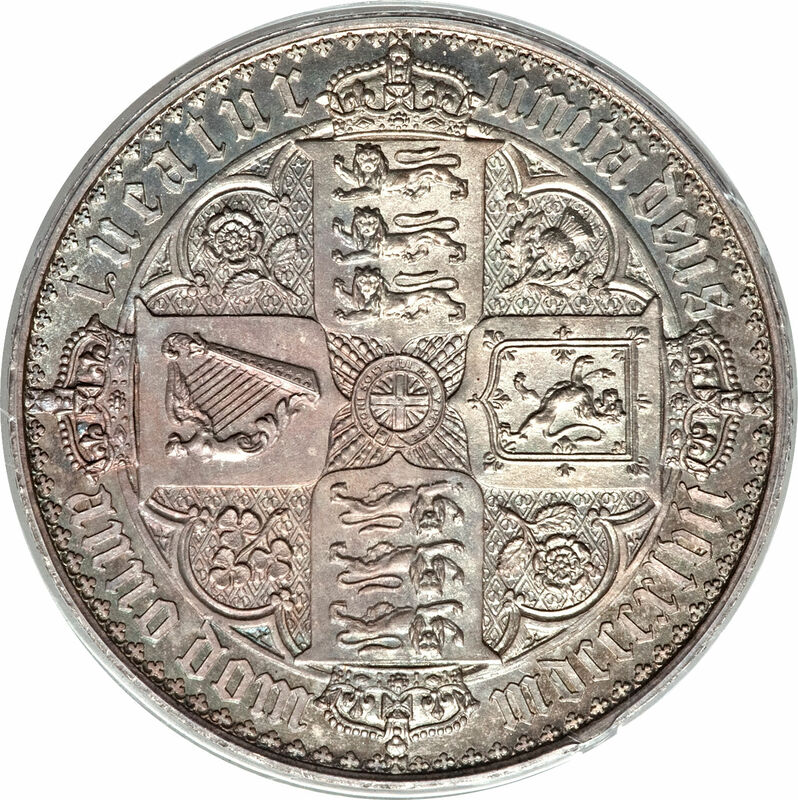 The reverse design was also by William Wyon, whose initials appear incuse on the circle at either side of the topmost crown. The reverse legend is also in lower case gothic style script: TUEATUR UNITA DEUS ANNO DOM MDCCCXLVII (Translation: May God protect these United Kingdoms In the year of our Lord 1847). Edge: The edge is inscribed in raised lower case gothic style lettering, with roses and crown separators: (crown) decus (rose) et (rose) tutamen (crown) anno (rose) regni (rose) undecimo. References: KM# 744, Sp# 3883/4. "Gothic" Crowns were produced for two years of Queen Victoria's reign, these being 1847 and 1853 (only as a proof edition). "Gothic" Crowns were designed by William Wyon, Where as the reverses were designed by William Dyce. They are dated using Roman numerals. 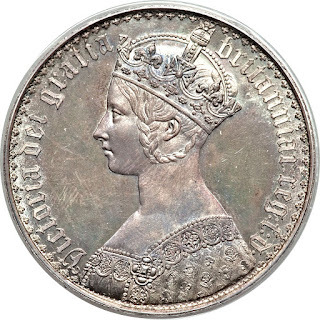 These Crowns were not issued for circulation and are therefor found in mostly extra fine to uncirculated condition. They are also highly sought after by many collectors and usually sell for quite a high price.